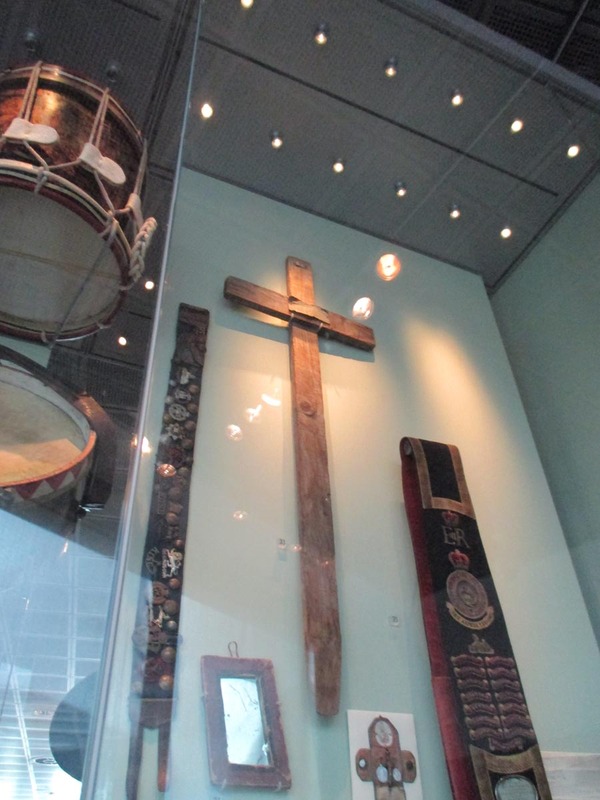 Location: Museum of Liverpool, Liverpool, Merseyside, L3 1DG. 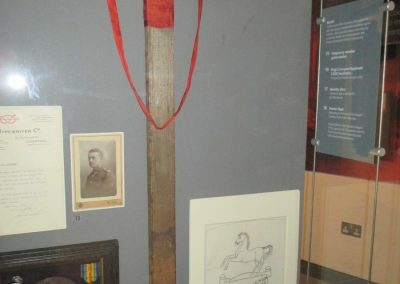 The museum is well worth a visit, the website is here. 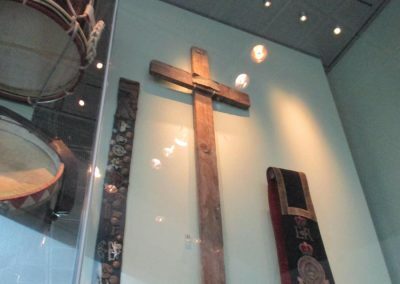 There are two crosses in the collections, both displayed and wall-mounted . Killed in Action 24th July 1916 age 19. Buried in La Neuville British Cemetery Corbie. Frederick Alexander Beer only son of Frederick Augustus and Alexandrina Beer late of St. Oswald Street, Old Swan & 3 Brereton Avenue , Woolton, Liverpool. Commemorated in St. Annes Church Stanley, Liverpool. 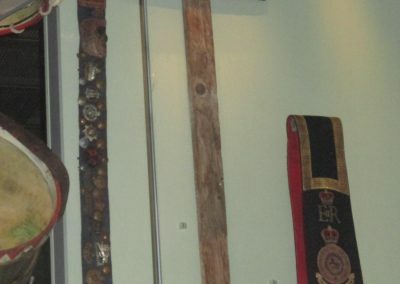 Thought to have come via the British Legion in 1920 suggesting to bring the original Great War grave markers home for the families, the two in the museum were returned in 1920 and held by the Liverpool Kings Regt until 1958 when they were given on long-term loan to the museum. 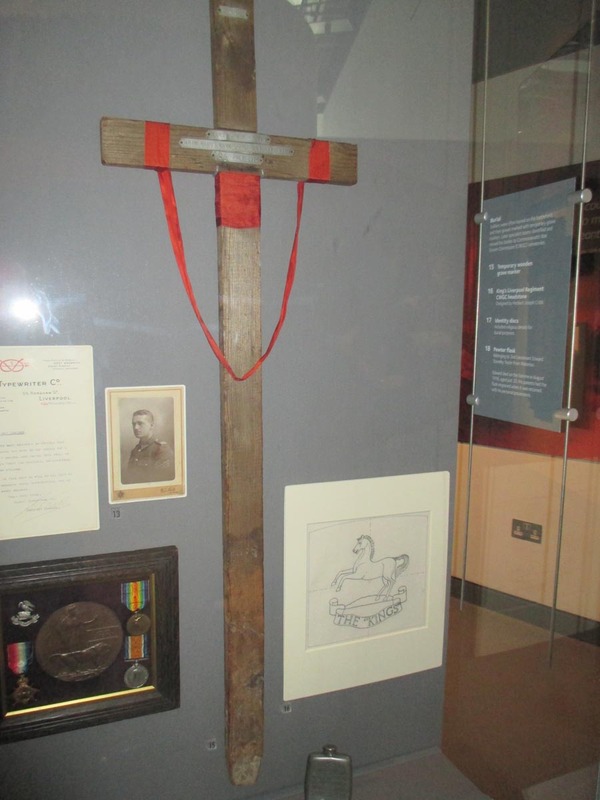 Small metal plaque on cross member, illegible. Assumed to be his name. 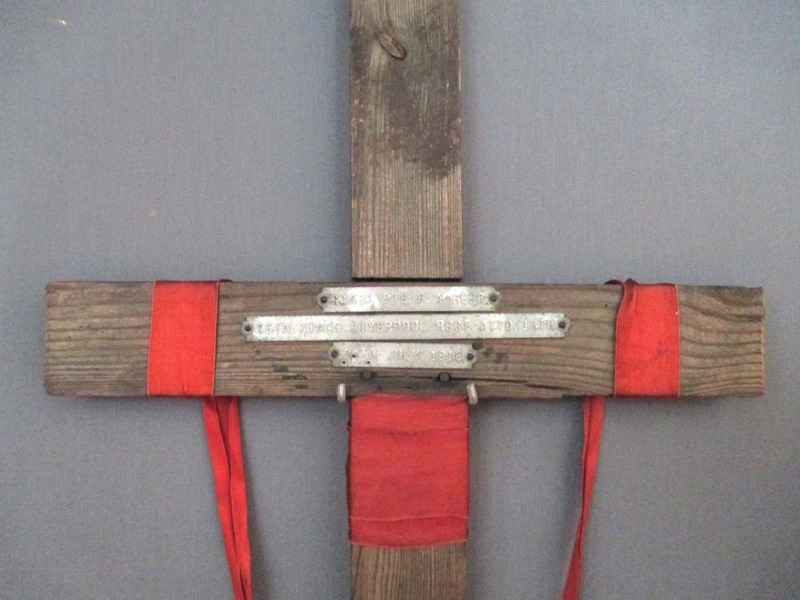 Detailing: small metal tag on cross member, no other markings. Shaft pointed at end. Evidence of use in field (earth marking, cracking, staining, shrinkage): Cross is in very good condition rough hand made smooth wood. Finish (varnish, paint, oiled, unfinished etc): No staining or varnish. Condition (cracked, paint peeling, woodwork, damage etc): Plain wood in good condition no obvious signs of deterioration. 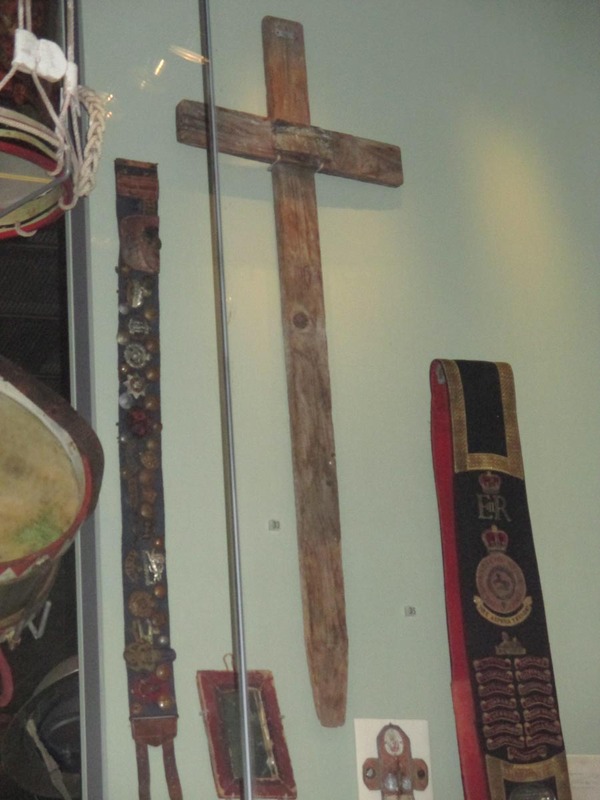 As with the other cross held at the museum it belongs to the Kings Liverpool Regt who had it since 1920 and gave it on permanent loan to the museum in 1958. Information given by Karen O’Rourke at the museum. 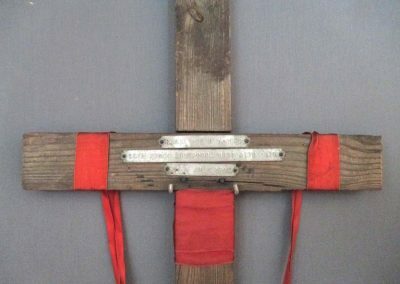 The cross was on the grave of James Reginald Lancaster, Rifleman 2337 Kings (Liverpool Regt) 5th Bttn. He died of wounds on 30.4.1915 aged 23. He was the son of James and Jane Lancaster. He lived in West Kirby, Wirral from 1911 but was originally from Liverpool – aigburth- a few hundred yards from where I now live. There is a biography on google written by a lady called Victoria Doran (too long to print here). here is a small pat of it. He was known as “Reggie” was born autumn 1891 was 5’ 7” tall, 36” chest. He had 2 brothers and 4 sisters. His paternal grandparents were from the Lake District. He was one of the first to enlist on the 28th August 1914 and among the first to die in April 1915 at 2nd battle of Ypres. He was not the perfect recruit as he was punished on 3 occasions for being absent from 7am parade. He went to France on 21st feb 1915. He was wounded in the right leg on 30thApril 1915, Military records show that he died in the field at No. 4 Field Ambulance but in fact he was at Bethune Town & Military Hospital and according to the French doctor who attended him he died at 1.00am on !st of May despite having had his leg amputated to try to save his life. He is buried at Bethune Town Cemetery . Survey and photographs with thanks to Margaret Draycott.